Four Weeks’ Worth of Work Outfit Ideas! Wouldn’t it be great if you had several weeks’ worth of work outfit ideas — and if the ideas mostly used things you already have in your closet — and maybe even pushed you out of your comfort zone a few times? I’ve wanted to create something like this for YEARS, truly, but between all the other regular content the work outfit challenge just hasn’t happened. Last summer and fall I really committed to finalizing it, and I’m thrilled to say that it’s DONE and you can now subscribe here! 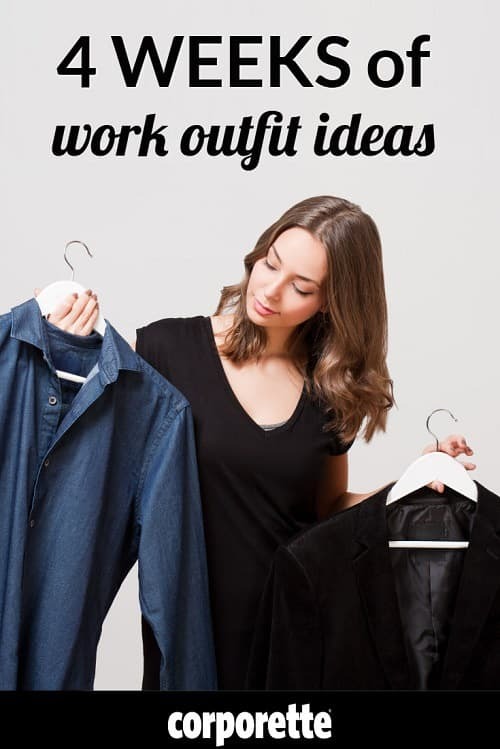 I’m proud of the end result — I think these work outfit ideas reflect a smart, sophisticated way of dressing that can be dressed up or down for various offices, and my hope is that as you go through the challenge you’ll stretch yourself a bit and hopefully find some new ideas. Every outfit idea in the challenge is appropriate for work, and 90% of them can be done using stuff you very likely already have in your closet. Because the ideas are more of “building blocks,” if you find a few of them that your really like you can turn the blocks into a work uniform. Because many of the building blocks ideas have examples of different bloggers from around the web wearing the outfits, you may even find a few new workwear personal style bloggers or Instagrammers to follow! It starts the first Sunday after you sign up for the email! Questions for this thread for you guys — what are YOUR favorite work outfit ideas, ladies? What outfits (or building blocks of outfits, such as black top + black pants + colorful/print jacket or cardigan) do you wear again and again to work? Have you (or anyone else you know) adopted a uniform or other concentrated way of dressing that has worked well for work? Uniform: black pants (slim ankle or trouser), flats, cardigan/blazer or dress, flats, cardigan blazer. Also, my wardrobe is entirely black, white/cream, grey, pink, red, and some blue. Everything matches with everything else. I don’t have time for this sh*t.
How did you both get to this point? Did you just do a complete closet purge/repurchase, or did you do it in stages? I think I’d like to get to this point, but am a little unsure of the best way to do it. I did it in stages with black, teal, green, grey, and ivory. And purged in stages, so I still have some shades of purple left over. It works, so I haven’t completed the purge and probably won’t until things wear out. Over 10 years or so? I was much more fashionista-y as a 20-something, but now I work in communications management, am 40 and a single mother, etc. It cuts down on time and expenses. the Vivienne Files (blog) is great on this! She often uses paintings as color inspiration, which is fun, and then builds the wardrobe step by step. I’ve learned a lot from reading her. Thank you – I heard about it on this site. Do you think there is a sweet spot for how many colors to include in something like this? I’ve started down the path with: black, white, grey, navy, camel (or tan leather), and olive/dark green. But I’d like to add a dark red/burgundy in there. Did you stick a certain number of colors on purpose or did it just sort of shake out that way? I’ve got a very similar colour palette to this – I just have cream in place of white. I’ve seen lots of advice out there that suggests having two neutrals and three colours, but I haven’t been able to stick to it! I think olive and burgundy are still considered fairly neutral, so I’ve also added rose pink and blush. Pretty much the same. Pants/blouse/topper and flats, or dress/topper and flats. I’m black, navy, gray, and camel, with either jewel tone pinks/purples, or jewel tone greens/blues, and not much else. Took me about 3 years to hone in on this look, but it was sort of always there: I had to edit down to this. Doing three big-ish moves since 2014 helped, as did really figuring out my professional goals and “home base” (which has come with a very modest salary…thus, shopping is limited). same colors! I read something (maybe linked from here?) where my goal is black pants, white/cream tops, and grey blazers/cardigans so I can think even less! I understand this is an old comment but I must say that I am SICK of the profanity. How lacking is one’s vocabulary that adults have to fall to juvenile profanity in order to make a point?! I just received a promotion that came after several months of talk about my new job description, talks with HR, etc (all between my boss and HR). Then, on Friday, I learn that the promotion has gone through and my new salary is $x. The new salary is about 7.5% higher than my old salary. Is it unreasonable to push back and say that I had been hoping for 10% or more? It was never clear to me when we would discuss salary and now it’s just being presented as a sort of gift. I realize I probably should have pushed to discuss salary earlier in the process but are my expectations of more than 7.5% unreasonable? Completely depends on your role, your new role, the market comps, your company’s salary bands, etc. Look at what market is for someone with the lowest level of experience in your role. Don’t compare yourself to someone with 5-8 years experience as a director, compare yourself to a director with 1 year experience, for example. Frame the convo about market for the role, not your personal increase. 7.5% increase for an internal promotion is really reasonable. my old company had a 10% max on any salary increases, even if you were moving up two levels. Kat, this is such a GREAT idea! YAY!!!! I love the idea of having a Professional dresser offer up suggestions to me on a daily basis. I often just pull things from my closet and wardrobe and they are NOT always the most color coordinated. I suppose I am a slave to the manageing partner’s taste, who requires that I wear RED as much as possible (with Red pump’s), except when he wants me to wear BLUE or BLACK, typically when we are takeing cleint’s out to the Lamb’s Club. He thinks that the lighting at the Lamb’s club makes me look cuter with a darker outfit against my blond hair. I think he is right b/c some of the senior cleint’s seem to ooogle me more there then when I am arguing their cases in court! Thank’s again, Kat, I will try it out, but will PRECLEAR it with the manageing partner to make sure he does NOT get mad with your choices! FOOEY! I think this is a great idea, but I really don’t want emails about it 5 days a week. Is there any way it can be added here? I think it would also be a good way to facilitate discussion about people’s different approaches. Ugh opposite. I don’t want to read this here every day. Yeah I’m curious but hate subscribing to newsletters of any sort. I think it would make a cool Friday feature (maybe in lieu of the weekend thread pick). My favorite is to dress in a neutral column of color – same or similar colored top & pants or skirt – and then wear a different neutral or a real color as my “third piece” – cardigan or jacket, depending on how formal i need to be that day. I have columns in black, two shades of gray, and navy. This works very well for me too. I would love if the emails were condensed into one per week, rather than daily messages. Me too. I just don’t want daily emails, and I would want to plan my work wear for the whole week and not just a day at a time (which is what I do now). I’d like a weekly email better than daily, too. And thx – can’t wait. Also prefer a weekly email. Yes! I would sign up in a heartbeat to a weekly e-mail, but a daily is too much. Ditto on the weekly email train! Sounds like a neat idea! I’m amazed sometimes at some cute outfits I can put together from my own closet that I would never have thought of if I didn’t see the idea somewhere else! I’m looking for a uniform. In my early working days, my outfit was solid colored top, pencil skirt, kitten heels. As fashion has changed, I’m having a harder time finding classic, well-cut tops to pair with skirts so I’ve gravitated toward some dresses. I’d love to find some more tops (both patterned and solid) in jewel tones that would look good with both skirts or slacks. Same on the tops, only with the caveat of “not transparent” added. I have some tops from LOFT that I wear tucked with pencil skirts and out with slim ankle pants. They are poly which I hate but there really aren’t many other options these days….I have to you Rx deodorant so I don’t sweat them out. I’ve moved towards buying all blouses in neutrals, which seem easier to find. Just white, black, and maybe one or two grey/navy. And then I save the few pops of color / jewel tones for the toppers (jardigans, cardigans, blazers). It actually seems to look better to my eye. Also a big fan of the column of one color. Very elongating. how many days can I wear a different black dress in a row? how many days can I wear a different outfit with light blue in it? how many days can I wear nothing but black and gray (hello, February)? Maybe we can have a dress challenge per week (with a head’s up on Friday)? it would be like a code for who else you encounter who may read this. I do this to some degree. I get something new or rediscover something I have but neglected, and I wear it over and over. My weekend outfits are particularly like this. I may wear the same thing for casual Friday and all weekend if I don’t get it dirty – just change underthjngs. This is more my thing in the winter when I’m wearing sweaters and thicker layers that I don’t wash every wear. Is there a hashtag for this? I’ve done similar challenges with the sewing community on Instagram, and it’s fun to see how others interpret the same prompts. Your email sign up doesn’t work. No confirmation link is ever sent. On your form you advise if that happens, resubmit the form…but when I tried, it wouldn’t let me, and told me I needed to use the confirmation link. Which I never received. Not impressed. The suggested outfits sound depressingly bland. Hopefully week 2 has more inspiring ideas. I agree. I think this a great idea! I just wish the outfit suggestions weren’t so random and maybe more classic. I thought it was supposed to work with things people already have in their wardrobe. Also, the examples are so dated? It would be nice to have examples that were more current and in style, not a mixed patterns outfit from 2009. So weird. I guess I was looking for something more BASIC?Ha. and straight forward. Does anyone else feel the same way? The suggestions just seem all over the place. I guess its nice to have options but I don’t even really see a theme with some of these. I love the whole IDEA of the work wear challenge as we are all looking for new ideas to wear our old clothes. I can’t do white or cream since I work in a fairly active environment, only have 1 plain white blouse. Pants: 1 pair of black, gray, navy, khaki, 1 splurge wine red skinny leg. Shirts have simple and subtle prints. One of the small flower ones i have is black and has soft blue, burgundy, pink. It literally goes with every cardigan (same colors as pants) and blazer i have. (1 back 1 white). In the sping, i basically do the same exact thing, but pants become crops. Been creating this wardrobe over the past 4 years. Still purging, but losing a lot of weight sort of forced me to purge faster. I don’t think the issue is making decent outfits, it’s making them over and over again. My solution is to have suits and suit-like sets (jacket/sweather + skirt/pants) lined up in my closet. I wear the next suit/combo with shirts/sweaters/tights/shoes and then move it to the back of the line. All of my decision making is spent on accessories and most of that is based on what ends up on my outfit. With a few caveats, if I skip an outfit or move it to the back of the line more than a few times, I toss it or re-make it.